I’ve made more biscuits lately than I have in a long time. Because Soup. I’ve been making a lot of Soup, too. Of all of the biscuits, my favorite are these. Serve them and everyone will ooh and aah & fight over the last one. I know, I know – they look like a Bisquick thing. But they’re not. 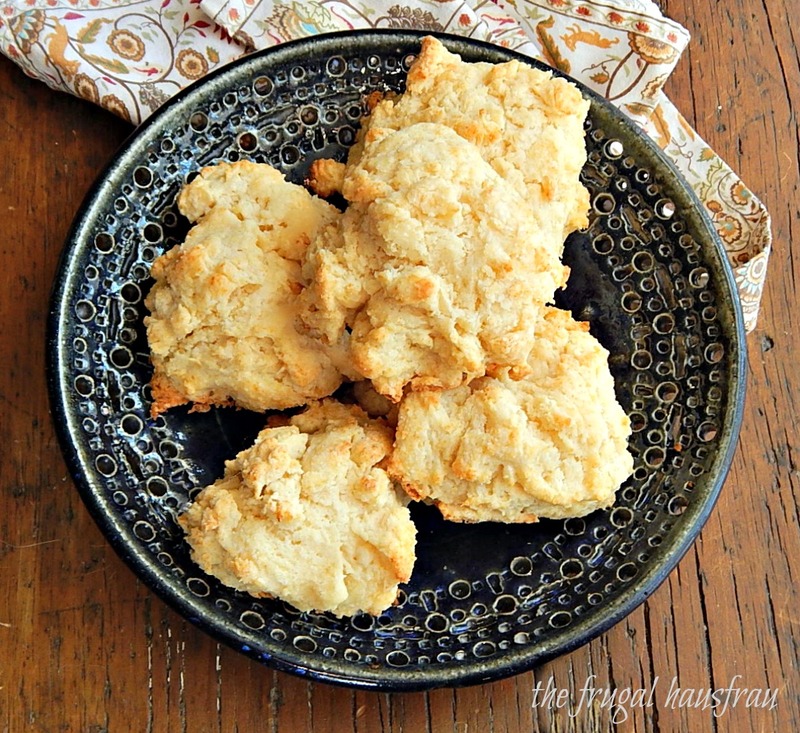 They’re the lightest, tenderest biscuit with a crispy top and fluffy center that you’ll ever bite into. They’re so tender that buttering them needs a technique, lest they fall apart when splitting. Take your fork and poke a series of holes horizontally around the middle, then carefully lift that lid up. As far as the butter, though, or jam, or syrup or anything else, these Drop Biscuits don’t even need it, they’re that good. I can’t say how well they keep – there’s never been one leftover! Count on two per person as these aren’t overly large. Always look for baked goods on sale and pay attention to the butter specials, especially during Holiday weeks. Toss that butter into the freezer to keep it fresh and freeze all products containing flour for three day to avoid any surprises. Preheat oven to 400°F and spray or lightly oil a baking sheet. Use fingertips to pinch and rub the butter into the flour until it resembles coarse meal with a few larger pea sized pieces. Add flour mixture and butter to food processor and pulse 2 to 3 times to form pea-sized pieces; transfer to a large bowl. Dump back in bowl. Add milk and toss with a fork until it just comes together into a slightly sticky, shaggy dough. With a knife, and handling as little as possible, divide dough into 8 pieces. Place lumps, patting them slightly into a round shape (lumpy top is fine) and handling them as little as possible, on baking sheet and bake for 14 to 18 minutes until golden brown. Serve immediately. This entry was posted in Click here for Fabulous Food Posts and tagged Biscuits, Bread, Frugal Hausfrau. Bookmark the permalink. You make such marvelous biscuits! These are like child’s play, lol! Maybe a good recipe for the kids to make…. Bless her heart!! I’m glad you guys enjoyed them and I bet she had fun baking with Grandma! I’m glad you guys enjoyed them – I’m just here for a few more days. It’s going to seem so quiet at home! I know Mollie– are kids left here a couple days ago and it’s so so quiet here now. We loved the biscuits– wrote up a post on them with a link to the Frugal Hausfau. Charlotte really had fu showing them off at dinner. thanks! I will have to check it out! 🙂 I just got home tonight and am missing all those messy little noisy people!! I was so tired, Rhonda. I took a long nap this afternoon! Can you use almond or flaxseed milk instead of cow’s milk? Dead simple is my kind of recipe! They look perfect! I say these are ‘drop dead gorgeous drop biscuits’😁 I haven’t tried making my own biscuits, but your biscuits are telling me that I am so silly!😬 These sound really good, Mollie! Thanks for sharing at Fiesta Friday party! It’s always fun to see you at the party! I DO love FF!! (The best bloggers are all there!! haha!! But really, they are! 🙂 ) Thanks for hosting for us!! Thanks, Elaine! I seem to be on a “simple” role, lately! Ooops – no pun intended!! These look and sound delicious! I saved it to my Pinterest board! Hi Abbey, and thanks so much! I appreciate the pin, too! Jess, sorry to reply so late – but you are the biscuit QUEEN! I wish I had a fraction of your biscuit talent! I do keep trying, though! Thanks much! I did like the pics!! We must both have biscuits on the mind – I posted some this morning too! 🙂 Yours look delish! I’m so behind in comments! I’ll have to take a peek! I am having trouble linking back to your blog – the gravatar doesn’t seem to be linked, just fyi!! In what way I can help you? Oh, now it is working! False alarm! Sorry!! Are you active in Facebook, Instagram…..so we can connect there also? ?